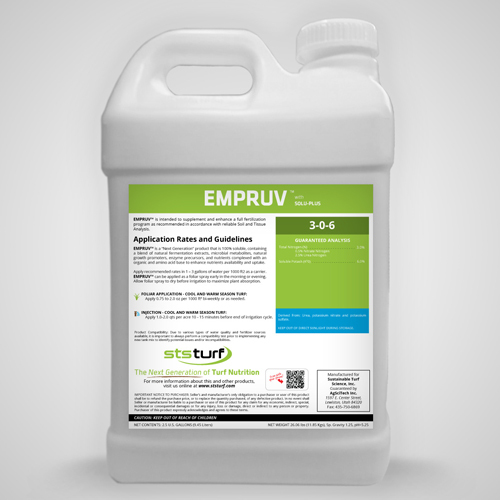 EMPRUV™ 3-0-6 rewards turf managers with reduced stress potential by providing multiple elicitors that will trigger plant defense mechanisms, as well as working to enhance the plant’s own immune system. EMPRUV is a result of years of research and development. Through our proprietary process, EMPRUV™ delivers a blend of natural fermentation extracts and microbial metabolites, natural growth promoters, enzyme precursors and components to enhance absorption. EMPRUV 3-0-6 could be part of a BMP fertility plan to naturally promote optimum plant health. Contains natural growth promoters and enzyme precursors. Rich blend of Natural Fermentation Extracts and Microbial Metabolites. Injection/Fertigation Rate / Acre 1.0-2.0 qts.